The vast majority of people enjoy the use of the Befuddled HD on there iPad machine. The application only costs approximately 2 dollars which is a cost-effective investment for the majority of users. Befuddled HD iphone app is a word game that can provide hours of fun for users of all ages. 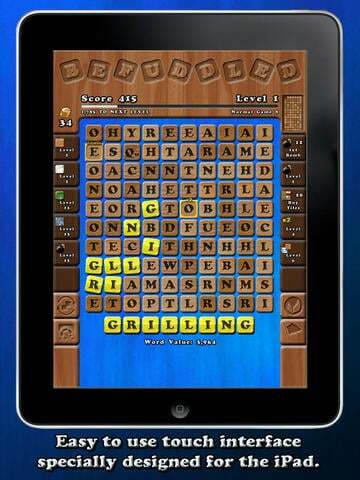 People that enjoy games such as boggle and Scrabble will certainly appreciate the gameplay of this application. There are also some features that are unique to this particular game which will be challenging and exciting for users who are looking for something new to do with their time. Befuddled HD app for ipad, comes with a game board that is 10 x 10. The focus of the game is to connect words that are adjacent to each other on the same tile type. Players are not playing against the clock, each level becomes more difficult as the specifications of what words can be linked together based on tile type is determined by each passing level. Users that are in a high amount of points can actually gain the ability to block certain types of tiles as the game goes on. This is very beneficial when these tiles are not easily accessible to connect with other words Moving to the next level means gaining enough points to be able to do so. Befuddled HD app for ipad is as much a strategy game as it is a word game. Placing words in the right location is very important in order to be able to move on to the next level. Many users get addicted to the game because they are trying to amass the right amount of points to journey into the next level of play. This generally means that the average person does not necessarily move quickly through the game. There are only a certain number of replacement tiles available. This means it’s very easy for players to get stuck. If the player gets stuck they will become frustrated relatively quickly. It is better than a person plans each movement with great precision as opposed to moving forward quickly and not being able to journey on to the next level. The points that have been garnered throughout the game can be used to purchase tiles when a person has run out of replacement tiles. If there are not enough points available to purchase tiles than the player must give up and start over. It is possible for people to keep multiple games going at the same time. This means if your unit has multiple users each user can maintain their game separately from your own. This is a blessing or a curse depending on your perspective because sometimes people will fight over who gets to play first. Some people find that having to tap on the entire word at the bottom of the screen to submit the word that delays the gameplay. Other people are not so concerned about this small detail as it does not take away from the enjoyment of the game The operating system needs to be running in your ipad at least 3.2 or higher for this ipad app game to function properly. Get this Befuddled HD iTunes Application Here.